The history of Austrian architecture has seen a long line of anti-establishment movements. This applies most prominently to Adolf Loos, who published "Ornament and Crime", an essay against the decorative elements in the Austrian architecture of both Ringstraßenstyle and floral Jugendstil around 1900. Works by Loos and his colleagues formed the foundation for an extremely plain and geometrical style that one can see in the German Bauhaus school of the 1920ies or in the Palais Wittgenstein in the third district. 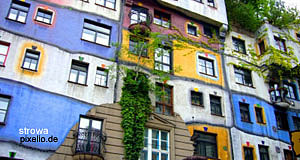 There is another architectural attraction in the third district: The KunstHaus Wien by Friedensreich Hundertwasser. This artist once wrote an essay in which he compared Adolf Loos with Adolf Hitler - to me a somewhat insensitive remark by a man partly Jewish himself, whose family suffered from Nazi persecution first hand; but anyway, Hundertwasser′s big motto was: "Die gerade Linie ist gottlos!" ("The straight line is godless"). He follows this motto quite seriously in both painting and architecture and there are three main buildings by this artist in Vienna that are worth a closer look. The Hunderwasserhaus in the 3rd district is a private, residential building and thus, not open to the general public. The caloric power plant in the Brigittenau a bit north of the inner city. And the KunstHaus Wien near the Hundertwasserhaus (only some 400 metres away), which serves as a museum dedicated to the paintings by Friedensreich Hundertwasser. The hippie-trippie-artist, whose actual name was Friedrich Stowasser, re-designed the building, a former furniture factory from 1892, and added his distinct style: Strong colours, lots of plants and - most importantly - no straight lines. The refurbishment took place between 1989 and 1991 and was supervised by Hundertwasser himself. Today′s KunstHaus Wien has 4,000 square metres of exhibition space and a permanent exhibition dedicated to Hundertwasser′s works alongside with changing exhibitions by other artists. It is among Vienna′s most popular museums, but mostly due to domestic visitors - for international tourists, it remains to be an off-the-beaten-track attraction. In the entrance hall of the KunstHaus, you will find a small fountain and the obligatory souvenir shop and the entrance to a restaurant full of plants. Hundertwasser loved plants and this might be part of the reason why he lived most of his later years in rural areas of New Zealand. The staircases in the KunstHaus Wien are twisted and a central opening in the roof with glass cover allows a lot of daylight to enter the building. Hundertwasser died a few years ago on a ship in the Pacific Ocean. Despite of his style never becoming very influential on mainstream architecture (he was always seen as an artist and not as an architect), his innovative approach to life in an urban environment added an original aspect to Vienna. His colours, plants and twisted edges opened a lot of space for being human and living a life. If you are keen on 20th century architecture in general, the third district offers three objects worth exploring: The KunstHaus Wien, the Hundertwasserhaus and the Palais Wittgenstein, designed by the philosopher Ludwig Wittgenstein in 1926 and now owned by Bulgaria that runs a culture society in the Palais now. The strict and plain geometry of Wittgenstein′s design gives a good idea of what Hundertwasser attacked when he talked about the "godless straight line". To me, it mostly reflects the different eras in which they lived and different states of mind. I could hardly imagine an analytically minded being in the search of order like Wittgenstein would come up with anything like the KunstHaus Wien. But I find it very stimulating that Vienna has enough space for diversity that one can now find a range of architectural styles in the city.